Did you know that animals use bubbles in all kinds of different ways? Sea otters use bubbles to keep themselves warm. Water spiders live in bubbles under the water. Spittlebug nymphs use bubbles to hide themselves until they're full-grown. And yes, herring "fart" (Fast Repetitive Ticks or FaRTs are the terms scientists use), possibly as a way to communicate with each other. 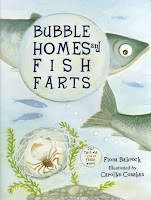 In Bubble Homes and Fish Farts, you'll learn about the ways many different animals use bubbles. It's told in a really accessible style that's sure to hook kids' interest and the beautiful illustrations include funny little text bubbles that add some humor. This will definitely be popular with any kid who likes animals (and, really, what kid doesn't like animals?). Each animal gets a two-page spread that includes information about how they use bubbles as well as their name, Latin name, and a beautiful illustration. A section in the back of the book gives additional information, including the size of the animal, its habitat and range, and more facts about it. The book also includes a glossary. And c'mon - the booktalk practically writes itself. I can picture myself standing in front of a class of third-graders and just telling them the title. They'll be clamoring for it and they won't be disappointed! Read more reviews at Jen Robinson's Book Page, The Well-Read Child, and The Miss Rumphius Effect. Don't miss Fiona's website or Carolyn's website. Fiona also blogs at Books and 'Rocks and you might want to check out Bubble Stampede where Fiona and fellow author Laura Purdie Salas blog about promoting their new books. This is a book you won't want to miss... and stay tuned because coming tomorrow I'll have an interview with Fiona as part of her blog tour! Happy Nonfiction Monday! MotherReader's got the roundup this week, so be sure you pop over there and check it out!